Feet often get more attention before vacation than at any other time, but what happens after you arrive home? Post-vacation feet need extra care, but with the right products you can quickly and easily restore their glory, and keep your feet feeling vacation-ready all year round. 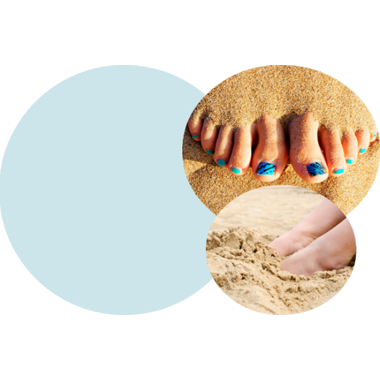 Once the vacation is over, many people let their foot care routine fade along with their tan. But it’s really important to keep the care going. If you’ve been somewhere hot, your skin may be drier, particularly if you’ve been walking around sandy or dusty areas, or spending long periods in the sun. If you’ve been enjoying some barefoot walking, this can contribute to cracked heels and thickened skin, which can lead to calluses. Vacations can also lead us to wear different shoes than normal – whether it’s new sandals, hours spent in flip-flops or a new pair of heels bought especially for the trip, our feet can take a bit of a battering from our choice of vacation footwear. If hot and humid weather has been teamed with non-breathable shoes, you may also be bringing a fungal infection such as athlete’s foot back as a souvenir. It’s one of the neediest times your feet will experience, so it’s really important that you maintain a good foot care routine after your vacations. It’s easy to keep the vacation-ready feeling when it comes to your feet, and ensure that any vacation wear and tear is put right. If you find that your skin has become drier and harder, the Amopé Pedi Perfect™ Electronic Foot File with Diamond Crystals is a quick, easy and convenient way to get rid of hard skin, leaving behind beautifully soft and smooth feet. Safe and simple to use, and needing less force than a manual foot file, it should be your number one tool in the quest for pedicure-perfect feet all year round. To help soothe and condition post-vacation feet, ensure to follow your foot care regime daily. Using moisturizing creams (such as the Amopé Pedi Perfect™ Extra Rich Skin Recovery Foot Cream), that contain vitamin A and E, almond oil and Pentavin® can provide moisture back into your feet in no time. Once you’ve restored your post-vacation feet to their former glory, keep a good foot care routine going and you’ll really reap the rewards. A little bit of attention every day will mean that having feet that look beautiful and healthy becomes quicker and easier in the long run.